Danny Horn from the Muppet Wiki left a very valuable comment on my wiki post. He shares some tips about building wiki communities. Thanks Danny! Hi Beth: I'm one of the founders of Muppet Wiki, and I think I can answer some of those questions about how wiki communities magically happen. The most important thing, which a lot of people don't recognize, is that you have to treat your contributors like they're people. You have to welcome them, help them, and encourage them. People who work on wikis are doing the most outlandish thing -- spending hours adding to a site without getting paid or even having their name attached to their work. People who host wikis should never stop telling our contributors how beautiful and amazing they are. I'm just about to hop on the plane to CA for Netsquared ... David Wilcox pinged me to let me know he has updated his Social Media Game! Wow! Leng Sopharath is the girl in the middle. 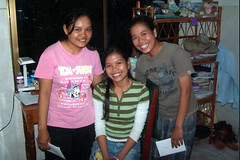 She is smiling and next two other young women who are being sponsored for college by the Sharing Foundation. I just received her April, 2007 letter where she shared what her daily schedule is like. I look forward to these quarterly updates and the photos. I also look forward to writing the quarterly letters that I send back to Cambodia with Dr. Hendrie. It provides a close connection and I am happy to share it with all the generous donors to the campaign like Scott via my blog. On the Web, you can become a messenger for your cause by adding a charity badge or fundraising widget to your blog or web site. With one click, visitors can contribute dollars to your cause! 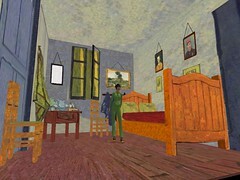 In Second Life, you can build a 3-D display and donation box where avatars can contribute Linden dollars. That's my avatar sitting on top of the donation box (it spins!) after making a contribution to Make A Wish. I was curious because this effort was not put together by the nonprofit organization, but by an individual, an avatar named "Yonder Doesburg," who decided to raise money in this virtual world for his favorite charity. He shared a lot about what works with fundraising in Second Life. Although the amounts raised in Linden Dollars sound impressive, the USD amounts are still modest. But, avatars who raising money in Second Life for their causes are also spreading the word to others. Why are you raising money for Make A Wish Foundation? In real life I have two nephews who both have Muscular Dystrophy or MD. MD has ruined their bodies and neither of them can walk. They live in their wheel chairs and can not get around with out them. They are 15 and 13 years old and will not likely live to 20 years old. The oldest one is very bitter. He has become anti-social and hates the world for his disease. He is fully aware of his impending death, and has a very difficult time dealing with it. It has caused a great strain on their family and those close to them. A couple years ago the Make A Wish Foundation granted their wishes and sent them with their family to Disney World. It was the highlight of their lives. For a week the boys were able to forget about their problems and enjoy life. My motivation for collecting Lindens in Second Life is to help grant other children their wishes. I contribute to this charity in real life too. I donate money every month through the Combined Federal Campaign. My brother in-law (the boy's father) has an account in SL and together we designed the Make A Wish donation boxes and set up the first donation site in 2006. In January, 2006, we had purchased some land and were playing around with ideas for what to build and make. We did the typical thing most folks do like throw up houses and trees and try out our building skills. Often when we were on SL together, we would talk about his sons and the help many people and charities had given to them. In the past they have received a wheel chair van at a discount and the boys have attended summer camps with other kids with MD. The trip the boys enjoyed the most was the trip to Disney World. These stories got to me, I get choked up easily, and it stays with me for a while. I had a tip jar in my avatar’s inventory, and thought it would be a great way to raise money for the Make A Wish Foundation. We put it together and built a small kiosk to place it in. 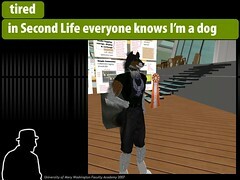 Tell me about your fundraising strategies in Second Life? It has been pretty basic. At first I bought small affordable plot of land and placed my Donation Cubes on them. I also purchased other plots that were selling for inexpensively and then resell them and put the proceeds towards my monthly donations to Make A Wish. These early efforts didn’t net as much as my main kiosk, but I managed to sell a couple plots and raise money for the charity. My best collections have come from placing my Donation Cubes in the same location as the vendors I use to sell my built items. In the past I would rent stalls at popular malls or shops and place the cubes prominently in front of my vendors. These did well for while, but would soon decrease. I think because many of the same patrons visited the same shops and I rarely received repeat donations. I sold all my land at one point when I moved to Alaska. When I bought my new land, I decided to have only one location with a much larger Kiosk and more information about the Make A Wish Foundation. I advertise the land with a few key words. Currently I have two locations to collect donations in Second Life. In the Sim of Iris, where I have my Make A Wish site, and in the sim of Paradise Isles. A friend of mine, Tabatha Binder, is an enthusiastic supporter of the Make A Wish Foundation and has one of my Donation Cubes in the center of her Palms Park Mall. 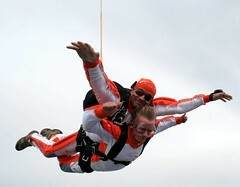 Donations for Make A Wish came to L$ 41,356 in 2006 or close to $200 USD. I watched the exchanged rate and exchanged my Lindens for real dollars when the rate was good. When I forward the donation money to Make a Wish, I use my avatars name as the donor and in the comments/message place I type “From the generous citizens of Second Life”. I gladly accept any and all donations from people while they are in Second Life. In the real world people should visit www.wish.org to make donations or see how they can help. I'm Live Blogging at NetSquared! On Tuesday and Wednesday, I'll be in San Jose at the NetSquared Conference where I'll join the live blogging team! See you in San Jose! In the past few months, a growing number of social networking, social change, and fundraising sites have made their debut. The space is heating up! Just this week there were posts about LinkedIn, Change.org, and Facebook/Project Agape in the nptech space. This week another site launches, Bring Light, and combines social networks and philanthropy and is designed to help small to mid-sized nonprofits connect with potential supporters. With number of options for social networking and fundraising out there, maybe we will see an Idealware article that does a point by point comparison of features and functionality? 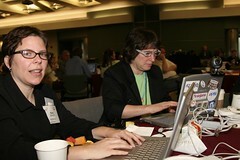 The NetSquared Conference is just days away and the NetSquared blogs are buzzing with activity! Each of the 21 Featured Projects has a project champion who will guide and support the project through conference. They are posting their introductions and photos here. If you're on Facebook, search for the n2y2 group! You can find the complete conference agenda here. Not attending the NetSquared Conference but want to follow the tag stream? You can subscribe to the Yahoo Pipe. Find out more here. The conference tag is n2y2. Peter Deitz has been working tirelessly on his personal fundraising campaign to raise an extra $500 for each of the 21 featured projects. His most recent update lists campaign donors. A big thank you! Sean Stannard-Stockton, author of the Tactical Philthanthropy blog, has posted a podcast interview with Daniel Ben-Horin, founder and president CompuMentor and TechSoup where they talk about the NetSquared project and the usefulness of "wisdom of crowd" techniques for nonprofits and philthanthropy. The conference participant introductions keep coming in! Eduardo Bejar, of Fundapi, representing Yankana, one of the featured projects, says "Hola Mundo" with a photo of himself with his right foot on the southern hemisphere and left foot on the northern hemisphere. I just love this video introduction from the good folks from Freedom for IP. 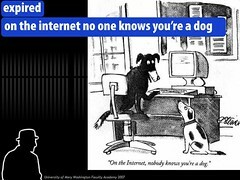 Expect lots of tweets from Netsquared next week and make friends with NetSquared on Twitter if you haven't already! I noticed a lot of "Top Ten" blog posts this week. So, this is going to be a NpTech Power of Ten roundup, noting ten themes from the week. A little Zen, but it is really hectic this week. And, speaking of Zen, the Zen Buddhist Center is looking for an IT director. Marnie Webb has been too busy to blog much this past month, but she finds time to tag!. Marnie tagged more than ten really good useful resources, including FullCodePress. Looks like a teams from Australia and New Zealand will compete to build a fully-operational website for a non-profit organization in 24 hours. Sort of like a Social Media Amish Barn Raising? Lots buzz about Facebook's new platform on blogs and especially on twitter (when it wasn't down for maintenance). 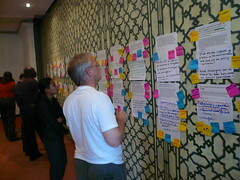 Buzz in NpTech space -- from blog to blog to tagged bookmarks. If haven't ventured into facebook, check Michele Martin's "Using Facebook in Your Nonprofit" roundup. If you're on Facebook, join the NpTech group so we can find each other! I bet there are more than ten nptechers on Facebook. Robin Good's "Ten Ways To Promote Your Business Using Social Media" are very translatable to the nonprofit space. JournaMarketing points to a blog post from Kayta's Nonprofit Marketing Blog called "Don't Speak Doglish" about clear communication guidelines. Marnie Webb tagged "Stories for Change," an online community of digital storytellers. Check out the curriculum resource section which has a lot more than ten resources, but not too many to cause information overload. The title makes me think of a Alan Levine's (Cogdog) recent presentation on social media called "Being There" where he offers a rather hilarious expired, tired, and wired metaphor about dogs and the Web. This slide show has at least ten visual jokes .... can you find them all? The roots.lab blog (Ian Wilker) summarizes a post from the PDF Conference last week "Campaigning in Social Media: Be Transparent, and Bet the Farm on Empowering Your Constituents." Alan Rosenblatt, Internet Advocacy Center, has a thoughtful post on the NTEN Blog, When Campagin 2.0 Met Citizen 2.0: A Confusing Love Story. Not a ten in these stories, but one post came from NTEN which rhymes with ten. Two tagging related posts. Order is in the Eye of the Tagger (an excerpt from David Weinberger's recently published book "Everything is Miscellaneous" and Lifehack has a terrific post "Top 10 Ways To Use del.icio.us"
Some geek fun that nonprofit techies will appreciate. Here's YouTube video about Ruby on Rails vs Java (in the style of an apple ad). Following the links, I discovered "Rails Envy"- "It's not the size of the app that matters, it's how you code it." It would have fit nicely if there ten episodes of this show, but this was too funny to pass up. 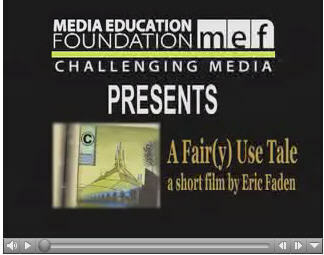 I lost count after ten in terms of the number of Disney Movies incorporated into this brilliant Disney mashup, a Fair(y) Use Tale that pushes the definition of fair use, directed by Eric Faden and came out of Stanford University's Fair Use Project Documentary Film Program. And finally, if you are drowning in email overload, here's "10 Ways to get a grip on your email." I'm off to tame my email box because I have way more than ten unanswered emails. For the Making Media workshop I am doing next, I was in search of examples of how wikis might play a role in "Filmmaking 2.0" (as coined by Arin Crumley and Susan Buice of Four-Eyed Monsters fame and chronicled by Steve Garfield). Interesting, Four-Eyed Monsters, the poster child for social media and filmmaking, does not appear to have a wiki. Maybe I missed it or perhaps there is a good reason why. I found the Wikipedia entry for Ken Burns. That's a start ..
That's why I so happy to discover that my colleague, Daniela Faris, at Icommons has written a blog post profiling ten fascinating wiki communities hosted by Mediawiki software. Her analysis of the communities focuses on how these communities have collected useful reference material and resources, people who have used wiki software in an innovative way, and communities who have been motivated to contribute on niche topics and popular cultures. 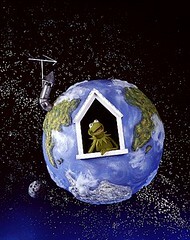 As she notes, "There’s the wiki weird and the wiki wonderful ..."
Established on 5 December 2005, Muppet wiki is a collaborative site about the Muppets and their creator, Jim Henson. With just over 14 000 articles collected to date, the Muppets seem to have a host of loyal supporters who are ready to contribute information about the ‘world according to the Muppets’. Of course online communities don't magically happen. So, in thinking of the practical application, one would need to study the patterns of wiki growth and development as well as the challenges. Wiki Patterns is a good resource for this information. I have the honor of leading a workshop for documentary filmmakers at the Making Media Now: Filmmaking in Transition Conference to be held Friday, June 1, 2007, from 9:30 am to 6:30 pm at the Photronics Center at Boston, University. You can still register. The conference is focused on the opportunities that new and emerging digital technologies create for media makers. My workshop is called the "Social Media Game: Market yourself and your film using blogging, tagging, wikis, photo sharing and social networking sites." I've remixed David Wilcox's Social Media game -- I've focused it on more individuals versus organizations and of course, on media creation. Here's the wiki I created with resources, links, and examples. The cards are here and I have to figure out a way to cut them evenly this time. It marks the first time I'm incorporating Twitter in a presentation. So, I just had to tweet about the presentation. Chris Brogan noticed and blogged it. Anyway, looking for feedback and pointers to other filmmakers using Social Media. I just finished the last segment of an online Webinar for Extension on tagging for knowledge sharing and collaboration. The first part was a presentation, the second part an action learning exercise over two weeks, and the final part a discussion to reflect on what was learned and putting tagging into practice. In terms of teaching practice, I made use of the online moderation techniques I learned from Nancy White's fantastic workshop about online facilitation, including the clock trick! My goal was to better weave together discussion/reflection about the process and inserting "how to" in del.icio.us (I saw this done very effectively on a demo of the nonprofit template from safesforce by Meghan Nesbit. What I did was the discussion for the first 3/4 and saved the how-to QA for the end. If I had inserted the how-to demo in the moment when we discussed it, not sure if that would have been confusing or helpful. I also experimented with pointing to other people's tutorials in the exercise instructions versus recreating my own which was probably less helpful to the beginner taggers. announce tomorrow its new LinkedIn for Good, which is a philanthropic initiative for raising awareness and raising funds for nonprofits around the world. Nonprofit organizations will be able to use LinkedIn as a platform for involving the LinkedIn community with their causes, leveraging the 11 million users that are present within the online community. Provided with this new feature are free badges to be placed on profiles, and registered nonprofits free job listings in order to find new members to join their teams. British rockstar James Blunt is already using LinkedIn to raise over $23,000 for Doctors Without Borders. Other featured LinkedIn for Good organizations include American Red Cross, the World Wildlife Fund and Unitis and Kiva, microfiance organizations. 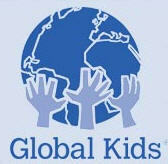 There's also another charitable donation social networking site that facilitates free surgery. The site itself looks like spoof site, but it isn't a joke. Personally, I'm very disgusted. I much rather see organizations that provided essential cosmetic surgery to children in the developing receive this type of media attention. I'm talking about organizations such as Interplast. I've been enjoying email threads with Steve Song about teaching tagging. He pinged me today to point me to his reflection on a recent tagging workshop. His blog looks like a valuable resource and I just subscribed. If you're interested in collaboration and facilitation from an nonprofit perspective, you should subscribe too. Of his own accord, philanthropy consultant, Peter Deitz, has launched a 10-day campaign across multiple online fundraising platforms to raise $500 for each of the 21 Featured Projects going to the NetSquared Conference. 3. Voting for the N2Y2 proposal on GiveMeaning. It needs 100 votes before GiveMeaning can start accepting donations. Big thanks to Peter for donating his skills and time to help take these projects to the next level! While the meebo nptech chat room is chatting live during the PDF, a few tweets overheard on twitter anticipate the upcoming NetSquared Conference. Momentum is building for the NetSquared Conference (N2Y2) beginning on May 29th. 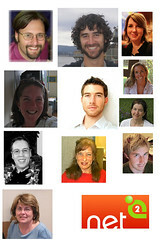 Like last year, conference participants are introducing themselves on their NetSquared Blog. Eric Leland is the first person to introduce themselves! If you participated in the voting process to select the 21 Featured Projects going to the NetSquared Conference, and want to see what happens next, take a look at the Conference Agenda. The 21 Featured Projects will have the benefit and challenge of being reviewed by experts in technology, economic sustainability, and social impact. Britt Bravo points us to "Socially Responsible Idol" a write up about the NetSquared Innovation Award nomination and voting process by Jessica Guynn on SFGate. I'm hearing some complaints about the distract-ability of social media. So, blog posts with tips on productivity are very much appreciated. Here's a terrific article from the Nonprofit Communications blog called "10 Ways Communicators Can Stay Productive" and from the Blog Bash event here's some tips specifically for bloggers on productivity. Rory Gale has a nice post called "Ten Ways Nonprofits Can Use Blogs and Bloggers to Support Their Cause"
BrandtobeDetermined posts about a UK outfit store that ripped off someone's flickr photos and the community response. If you want to be see photos being posted to flickr via a moving and zooming map interface, check out flickrvision - it rhymes with twittervision. The Daily Rebellion blog gives nonprofits some tips for using MySpace for members and money. JournalMarketing's advice to communicators and execs: Doing new media is more important than learning new media. An excellent primer about RSS in Teaching Hacks Wiki that looks at RSS in terms of different outcomes - productivity, professional development, community building, and others. Peter Dietz has an article explaining why we need group fundraising RSS feeds. Marshall Kirkpatrick's Comparing 5 Ways To Tag Videos hit dig popular. Fight Hunger shares the results and learnings from its Second Life fundraising event "Walk the World." And now, you can bookmark Second Life locations (called slurls) into del.icio.us without leaving the virtual world! There are different flavors of Creative Commons licensing, some encourage remixing more than others as the Learn Online blog points out in the "The Illogical rhetoric of Share Alike"
Ruby Sinreich points us to Liza Sabater's manifesto on People Powered Politics based on the seminar Cluetrain Mainfesto. Christine.net writes about recommendations engines. (You know, I'll have what she's having). She shares four Recommendation Paradigms to Watch. The Pew Internet and America Life Project recently released report on the "Typology of Information and Communication Technology Users" has created a buzz in the nonprofit tech spaces. The big question, what about that other 41%? Robin Good's site has published a summary of a report by Australian Flexible Learning Framework called "Social Software: What It Is And How It Impacts Individuals and Organizations"
Reading the live blogging from the PDF Conference and twittering is making a lot of us wish we were there. If you were not lucky enough to get to Australia to attend the Connecting Up 2007 Conference (the nonprofit technology conference for Aussies! 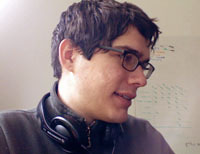 ), you can catch up with Mike Seyfang's live blogs, twitters, pipe, and more, including this interview with Daniel Ben-Horin from CompuMentor. Katya Andresen points us to "Story Telling As Best Practice" online free training with Andy Goodman. Webinars about personal fundraising (with Kevin Bacon) and Open Source Software (Michelle Murrain) over at NTEN next week. The AFP Blog points us to a good resource about "How to Keep Hostile Jerks From Taking Over Your Online Community"
While several years old, Commoncraft's post "What are the differences between message board and weblogs? is still relevant. Jon's comments on plone comments. 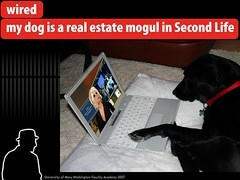 Check this out, an entire blog devoted to Webinars! Katrin Verclas at NTEN is in love with Google Analytics V2 and so is Laurie Quinn. It's prompting some conversation in nptech space and beyond. According to the NTEN blog, Salesforce and Salesforce Foundation has released a wiki documenting the nonprofit template. Nonprofit Tech Blog points us to the Nonprofit Success Guide wiki. If you've heard the term Enterprise 2.0 and not quite sure what it is, here's an excellent presentation that explains it in plain English. Jon Stahl found a nifty online slide show web application. Gmail integrates PowerPoint presentation tool for attachments. How cool is that? A roundup of five online video editing suites. None of these free services is going to put installed desktop video editors out of business, but they provide some easy ways to get started with video editing. We all know what a pain it is to schedule meetings via email. There are online applications that are designed to make that an task easy. Here's one that showed up in the NpTech Tag Stream: Doodle. 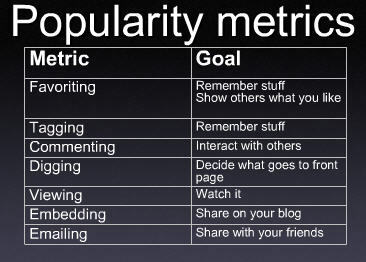 Stephen Downes summarized my post on Social Media Metrics and Measuring Blog Outcomes and added some commentary. I agree with some of his points and disagree with others. Return on Investment (what's in it for you/your business)"
Would this newsletter be twice as good if I wrote twice as many posts or wroite them twice as long? If I wrote about a more popular topic - educational policy, say - I would have more readers. Would that be better? Is Will Richardson better than me because he gets more comments? Am I better than you because I have a higher Technorati rank? Would it be better if I made money and spent less on my website? I agree with you that it is meaningless to use the numbers to get into "mine is bigger than yours" comparisons to measure quality or popularity. Some pr professionals agree. Yes, you can't measure friendship or reflective moments, just like in the nonprofit sector we can't measure world peace. With all due respect, I think you really missed the point about the usefulness of combining numbers with qualitative reflection on how to improve your blog. Whether you want to make money or educate people or just deepened your own learning -- setting some realistic benchmarks or goals, figuring out a way to determine if you reached them, and reflecting on why or why not - can lead to continuous improvements in the quality of your blog writing. AND, if that leads to more readers, higher ranking, more subscribers, more comments - that's the icing on the cake! Kathy Paine left an interesting comment on Kaushik's blog "you’re trying to engage employees or customers in a conversation, and improve your relationships, these metrics fall short." I hope she will unpack that a bit more. Stephen responds to this post here.